But, where is the PacBio Sequel? Last year, Pacific Biosciences announced the launch of the Sequel instrument, which according their website “delivers about 7X more reads with 1 million zero-mode waveguides (ZMWs) per SMRT Cell”. However, there are currently no specifications for this instrument on the PacBio website. The brochure about the Sequel System has metrics of a typical run, but these are from data obtained on the PacBio RS II, not the Sequel. I appreciate it is not easy to come up with metrics for this type of sequencing technology, where so much depends on the sample and library types, but I still need them in order to make my visualisation. Thus, until the company adds specifications for their new instrument to their website (or brochures), I reluctantly cannot add it to my visualisation. The next best thing PacBio could do would be releasing some data (and the company has an excellent history of doing so). If these specifications or data appear soon, I’ll update the illustration and this blog post. I finally switched to using python for generating the ‘bare’ plot (without the images of the instruments), see the Jupyter notebook in the git repo. Data and figures are released under a CC BY license at figshare, with doi 10.6084/m9.figshare.100940. I’ve also added the content to Github at this repository . Data are based on metrics available from instrument providers websites, sources listed in the table can be found here. As before: although I took utmost care in collecting the data, I may have gotten some of my numbers completely wrong, for which I apologise in advance; please help me correct any mistakes or omissions through leaving a comment (or sending me a pull request). This entry was posted in Next Generation Sequencing and tagged 454, Illumina, Ion Torrent, oxford nanopore, pacbio. Bookmark the permalink. Great work Lex…when do expect to add Qiagen’s instrument to the visualisation? All I can find about the GeneReader is in here http://www.bio-itworld.com/2015/11/9/qiagen-releases-genereader-clinical-sequencing-cancer.html where it says ‘around 100 base pairs’, but also ‘QIAGEN hates talking about the specs. The company line is that most of these metrics are irrelevant to a system that’s only meant to run panel tests, with the analysis and interpretation baked in.’ I couldn’t find specs on the website, nor in the brochure. So, I can’t add it right now. And that is ignoring the fact that it is an targeted-amplicon-only instrument, i.e. perhaps not really comparable with the other instruments in the figure. The only one additional informative thing to see added would be approx. price per sequenced Gb and how also it has changed in time perspective (although complex). Btw. 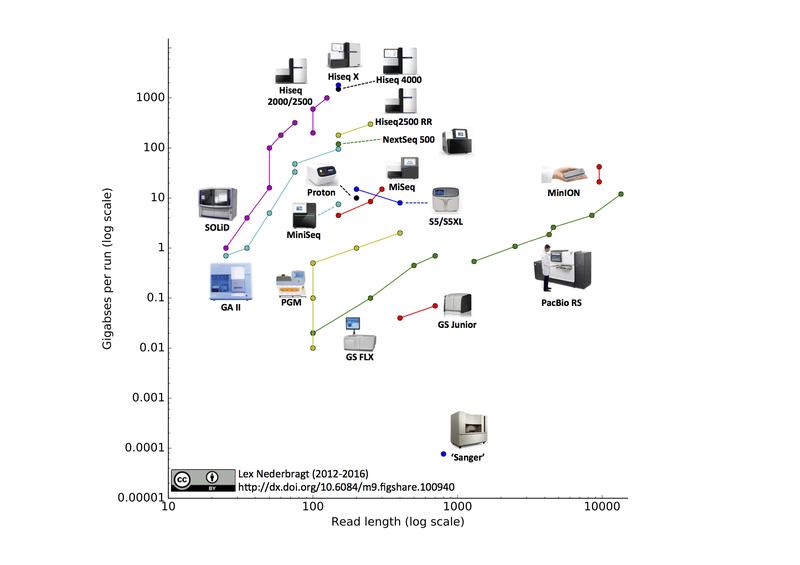 also in June in Nature one review has been published – a 10 years perspective into NGS, which you might find interesting ( http://www.ncbi.nlm.nih.gov/pubmed/27184599 ), especially for comparison of the current SMRT long-reads with Illumina upcoming long-synthetic ones or 10XGenomics. Thanks for the link – it is on my still-have-to-read list. About pricing, I made a conscious decision not to try to include price information, it is too difficult and too much dependent on local factors (how the sequencing is financed, for example). Others, e.g. the Field guide to NGS, do include prices. Greatly appreciate the publicly available figure, which I’ll incorporate (with attribution!) into one of my lectures. Look forward to the next update, now that there are reports (at least on twitter) of reads around a million bases long on the MinION (my lab has easily got reads in the >100K range).